I don't know about you, but I love to see how other families "do" this whole homeschooling thing. It introduces me to new methods, other curriculum, and gives me new perspective. Now, I can't say what we do is as helpful or fascinating as what others do, but I am excited to participate in the 2014 Virtual Curriculum Fair for the first time this year. Each week during the month of January, we will be focusing on one subject area, and sharing how we homeschool (or unschool) that subject. The first theme is Playing with Words: the Language Arts. For reference, we are relaxed homeschoolers that are influenced by many of Charlotte Mason's methods, but I try to follow my child's lead more than anything. Elliott is 7 and in the 1st grade. Emory is 4 and in Pre-K, but is not required to do formal work. The only area of Language Arts that is semi-formal is Elliott's reading & phonics. He is an emerging reader, and I want him to have some regular practice. Right now he is using Reading Eggs a few times a week for practice. We also do a lot of reading aloud and buddy reading to build fluency. We cover grammar, spelling and vocabulary a bit more informally. We reviewed IXL.com in the fall, and we use the 2nd grade grammar on occasion. We also reviewed VocabularySpellingCity around the same time, and I sometimes set up the lessons to coincide with his reading. After that, the only thing that is consistent is Literature. This is my favorite subject in the Language Arts umbrella! We just read. My only criteria is that we choose quality, living books. We read picture books and we read chapter books. We read fiction and non-fiction. We read Mother Goose or fairy tales or poetry. Sometimes we read a book and do a fun activity like in Hear Your Heart. We read as "school" and we read for pleasure. Since the boys are close in age, they usually listen to everything together, although I don't expect Emory to sit through some of Elliott's longer readings. I don't worry about analyzing or dissecting, but the boys do narrate on their own, and we do discuss! We "supplement" all this with fun board games, educational apps and a little foreign language--we dabble in Spanish here and there at home, and Elliott takes Latin at co-op. It's all very light and informal. The mechanics of reading is important, but my biggest concern is to create an environment that encourages my children to have a desire to read, a love of reading. If they want to read, they will be more eager to learn the whys and hows. The rest will fall into place. 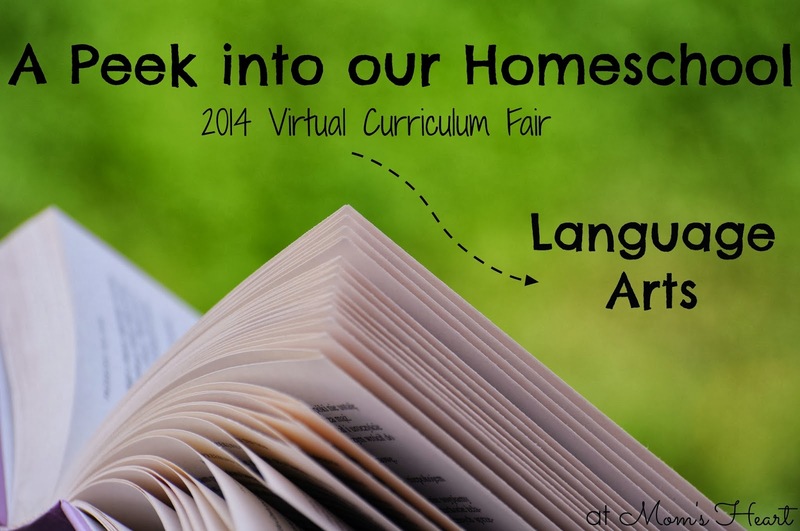 Now, these other bloggers are also participating in the 2014 Virtual Curriculum Fair, so be sure to check out how they "do" Language Arts in their homes! Stay Tuned for next's week installment: Discovering Patterns: Mathematics, Logic, and Science. I've found that with young kids, often informally learning spelling and grammar is the best way---it just sticks with them because they can see more readily how it applies to real life. Thank you for sharing your take on language arts!